We’d love your help. 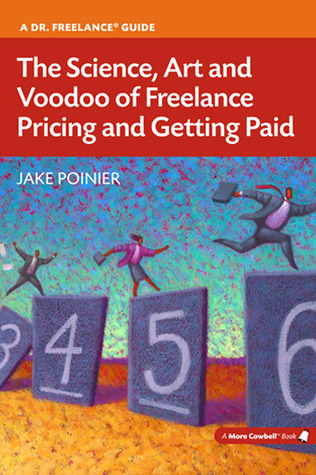 Let us know what’s wrong with this preview of The Science, Art and Voodoo of Freelance Pricing and Getting Paid by Jake Poinier. Are you struggling to price your freelance services profitably? Do you feel as if prospective clients always have the upper hand during the sales and negotiations process? Or are you busier than ever but not making as much money as you believe your skills and experience warrant? You’ve probably thought, “There’s got to be a better way to do this”--and you’re absolutely cor Are you struggling to price your freelance services profitably? Do you feel as if prospective clients always have the upper hand during the sales and negotiations process? Or are you busier than ever but not making as much money as you believe your skills and experience warrant? You’ve probably thought, “There’s got to be a better way to do this”--and you’re absolutely correct! To ask other readers questions about The Science, Art and Voodoo of Freelance Pricing and Getting Paid, please sign up. A very informative, fun, and quick read that has some solid tips on pricing your services as a freelancer. I'd recommend it to anyone (especially a freelance editor or copywriter) who's not sure what to charge or how to best deliver proposals or spot nickle-and-diming clients. Solid 4. I picked up this book at the Editorial Freelance Association conference in 2016. Even though a significant amount of information in the book was information I had read before, the content was offered in a useful and coherent manner. I appreciated the anecdotes and examples provided, as well as the "equations" to pricing work. There are specific questions I have that weren't answered in this book though, which I'll have to search for elsewhere. Sound practical advice for anyone selling their creative or artistic services. Highly recommended. Very short informational book to help freelancers figure out what they should charge for their work. Unfortunately, I've heard all this advice before. As the founder and owner of Boomvang Creative Group, Jake’s client list includes Apollo Group, AT&T, Starwood Hotels/Troon Golf, National Speakers Association, Behr, Henkel, and Johnson Controls, as well as a diverse array of small businesses, graphic design agencies, web firms, and ghostwriting clients. Over the course of time, he’s written everything from brochures, white papers and websites to radio ads, video scripts and speeches for Fortune 500 CEOs. A graduate of Yale University with a B.A. in English, Jake lives in Phoenix, Arizona, with his wife Kay, kids Nick and Maddy, and his loyal canine co-workers, Mowgli and Shanti.